Dinora and Rufus, from Mexico and Canada respectively, met on a beach in Oaxaca, a southern Mexico state, in 1994 and have been in love with this mystical region of the country ever since. 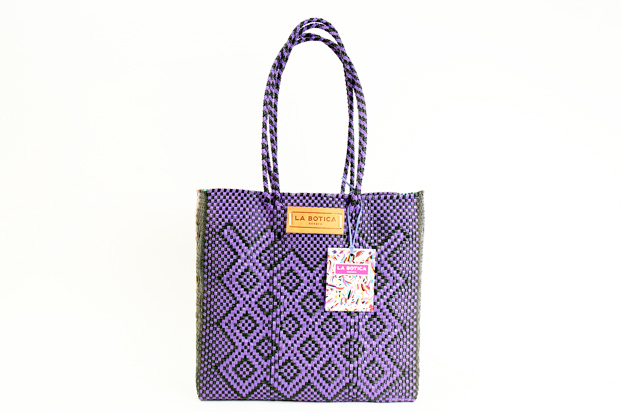 Upon discovering Oaxaca’s woven tote bag, they were immediately taken by the bright colors, intricate designs and fine craftsmanship required to make them. They were equally inspired by the story behind the goods: prisoners in local jails crafted each bag as a way to support their families and receive vocational training. Dinora and Rufus knew then that they had to share the bags, and the important story behind them, with the rest of the world. A beautiful, handwoven navy blue and red tote bag by artisans in Mexico"s Oaxaca province, known for its bright colors and intricate design. Versatile and durable - bring this to the market or beach! 13" x 12" x 5" (11" strap).Recycled Plastic. Leather "La Botica" patch.